A recent article in the Economist argues that Thanks to education, global fertility could fall faster than expected. The authors of this paper find that fertility rates in Africa stalled in their decline because of disruptions in education for girls. Now that education for girls has picked up, we should expect to see fertility rates decline. But will this hold true even with the current poor quality of education? In a previous Puggle we shared three studies from Malawi which suggest the answer might be “no.” The Population Council has a systematic review coming soon that will shed more light on this question. The first chart comes from the 2018 Ibrahim Index of African Governance. 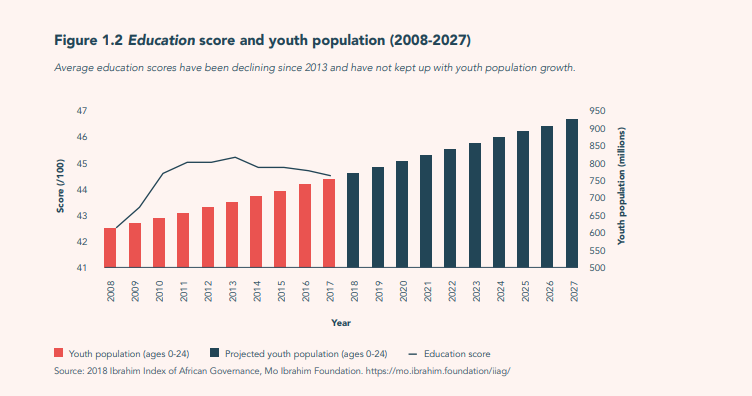 Declines in the Index’s average education score indicate that education outcomes are worsening for over half of Africa’s youth, even as the youth population grows (perhaps because of it). The second chart comes from the Cambridge REAL Center’s recent report on 12 Years of Quality Education for All Girls. In most Commonwealth countries the number of years of learning girls acquire is but a fraction of the number of years they spend in school. The third chart comes from Young Lives’ summative report on Delivering on every child’s right to basic skills. 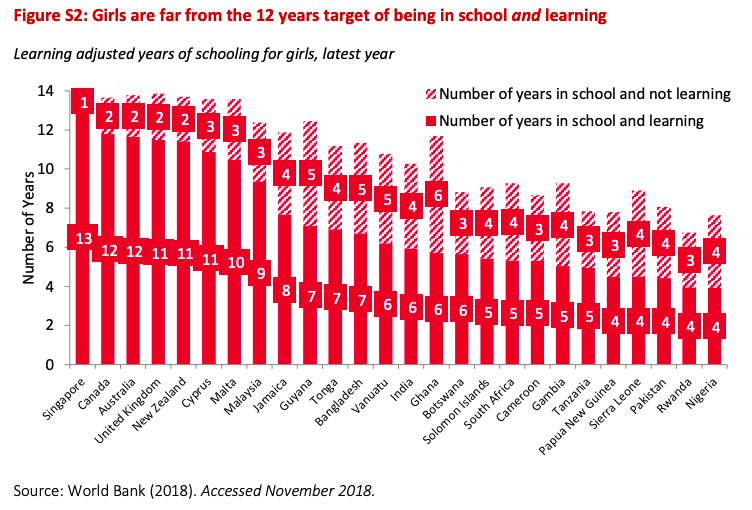 It shows that especially in Ethiopia and India a worrying number of children have not learned much by age 8 and the story doesn’t change by age 12. Is there any reason to hope these charts might look different in the future? We think so. The last chart and accompanying Young Lives research shows that low learning profiles are not inevitable. In the case of Vietnam, very few children start and end with poor learning outcomes. There, the government has set an expectation that every child will acquires basic skills regardless of family circumstances and devised an equitable financing system to ensure this happens. The World Bank has launched an open source classroom observation tool to make it easier to track one of the most critical elements for improving learning: teaching practices. 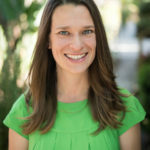 “Teach” covers many things you would expect, like how much time teachers spend teaching and students spend on task, and some things that are less common but equally important, like the quality of teaching practices that help develop students’ socioemotional and cognitive skills. We were pleased to see that the tool also looks at whether the teacher exhibits gender bias and challenges gender stereotypes in the classroom. The REAL Center report (featured in chart #2 above) emphasizes prioritizing early education to “influence girls’ retention and learning in the long term.” We think the report is right to point out that there has been limited focus on girls’ early education. For other interesting reads from January, don’t miss The Ghost Statistic That Haunts Women’s Empowerment, the impacts of Gendered Language, and, for social and emotional learning enthusiasts, A Nation at Hope.